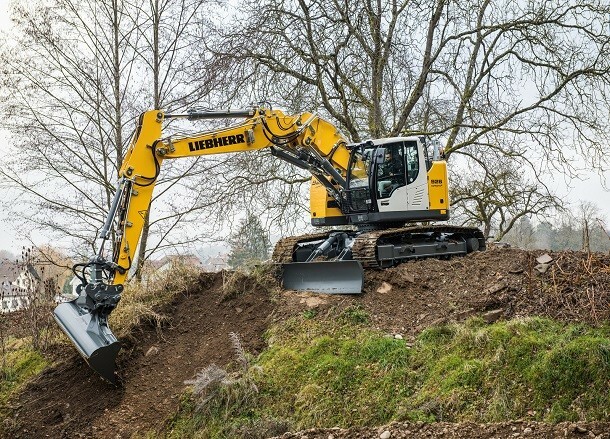 Liebherr completes its range of compact Stage IV machines from 15 to 35 tonnes with a new crawler excavator. Called the Compact R 926, it is an evolution from the previous model (from the IIIB Stage). The R 926 Compact crawler excavator has a Diesel engine meeting the requirements of the Stage IV / Tier 4f European norms. This one is completely developped by Liebherr in Bulle (Switzerland). Developping 130 kW, it is more efficient than the previous model (8% more engine power). With the integration of hydraulics components, the torque of the turntable rotation lock is 84 kNm (18% more than the previous model). This performances combined with a reduced total turning radius (less than 4 metres for the front and back) allow this machine to be efficient on rough construction sites, for instance when working on steep or confined spaces on urban construction sites. Moreover, additional equipments can be added depending on the specificities of each construction site. The maintenance operations of the machine have been improved. Indeed, now the exhaust after-treatment system happens without particle filters or EGR valves. The needed lubrication of the R926 Compact components has been automated with a centralised greasing system. This easy maintenance offers a high level availability to this crawler excavator with less frequent and less long immobilization. It also implies a better safety for the operators in charge of the maintenance while reducing the budgets.